The 2016 General Assembly was intense. LoraKim and I arrived in the evening, Tue Jun 21 and checked into the Ohio State dormitory, 2 miles from the Convention Center. This gave us a nice stroll in each morning of the assembly, and a nice stroll back each evening, with a stop at one of the restaurants for dinner. That was the relaxing part of an otherwise challenging and invigorating GA. The intensity began with the first event we attended: On Wed afternoon, the concluding and open-to-the-public portion of "Ministry Days" is the annual Berry St. Essay. 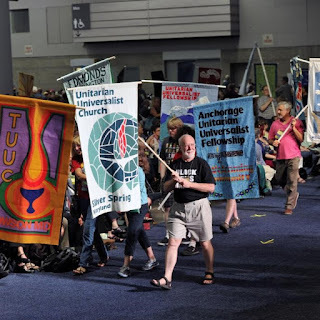 This year -- the 194th consecutive year of the essay series that once-upon-a-time was delivered at a conference on Berry Street in Boston and now is delivered wherever the UUA General Assembly is -- Rev. 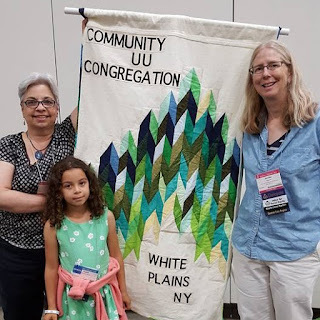 Gail Seavy of Nashville, TN gave a searing account of how many of our congregations have been damaged by clergy sexual misconduct, abuses of power, and secrecy. The full text will be online eventually, and I look forward to reading it again. It was that powerful. In the meantime, see the UU World's article about it HERE. Wed evening was the opening celebration kicking off General Assembly proper. The banner parade is always a joyful and moving sight! The 2016 GA brought a special focus on interfaith cooperation and attention to racial justice -- as described HERE. Much of what happened at GA was covered by outside news organizations. See the "media round-up" of that coverage HERE. You can read about each of these four by clicking on the titles. The delegates voted on Thu Jun 23. I voted for "Ending Gun Violence," and LoraKim voted for "A National Conversation On Race," but "The Corruption of Our Democracy" won. As I listened to the floor debate, my guess is that the argument that swayed many delegates to focus on democracy was the point that we'll never get anywhere on the other issues until we clean up the money and corruption that stymies popular will. You might decide not to take the time to read the also-rans, but please do take a moment to click on "The Corruption of Democracy" above for a brief account of what this issue is all about. After GA, Rev. Peggy Clarke (Hastings) and I got together and made plans to offer a first discussion of this CSAI in September. The session will be largely "book group" format -- and the book we chose for starters is Parker Palmer, Healing the Heart of Democracy. See the Amazon description and order your copy HERE. 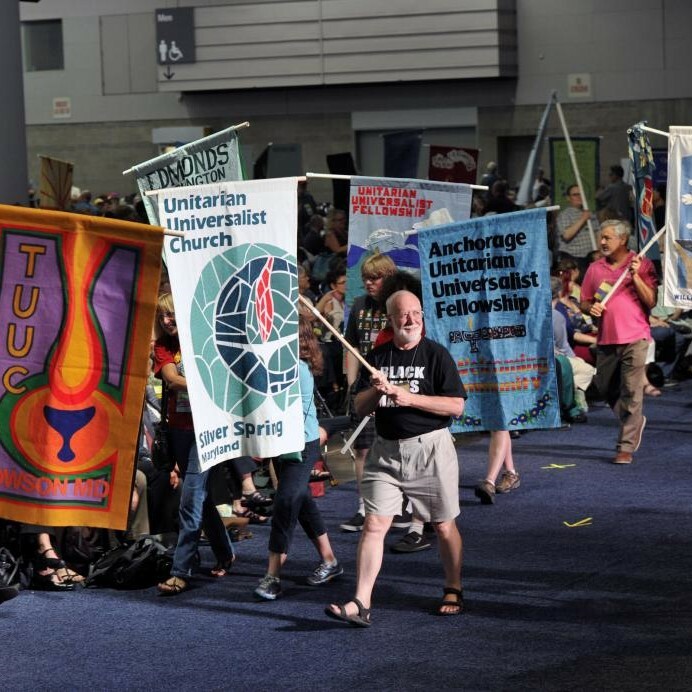 "Delegates at each annual General Assembly have the opportunity to take positions on issues that require immediate witness through the Action of Immediate Witness (AIW) process. An AIW expresses the conscience and carries the authority of the delegates at the GA aat which it is passed. AIWs are initiated by individual delegates and move through their entire creation and adoption process during a single GA."
Every year, the delegates may approve a maximum of three AIWs, which are statements of the delegates. By Sat Jun 25, a slate of six proposed AIWs had been assembled, from which the delegates chose three. E: Support HR 40: "The Commission to Study Reparation Proposals for African Americans Act"
The winners were A, B, and F. You can see the text of them HERE.